If you come here regularly, you may have noticed a few changes here and there. Nothing too major. Just a slightly different look. You see, I was trying to edit some coding “behind the scenes” and messed up the entire blog. I used to be pretty good with code-editing, but because I haven’t done it in a while, I realized I’ve actually forgotten quite a few things. I found the original file that I was trying to edit, and attempted to replace the messed up file with the original, but that didn’t work either. !!! Eventually, I came to realize that the blog theme I’m using had an update available, so I deleted the entire messed up theme and uploaded the updated theme. Ta-da! Brand new shiny blog look! And since the blog had a (slightly) new look, I decided to update some logos and headers. Oh, and I finally got around to uploading photos for the all the older recipes that had no photos (because someone accidentally deleted them 2.5 years ago *whistles innocently*). It took just over a week to finish all that up. So I’m now happy to report that this blog is now 100% completed (well, as completed as a blog can be, anyway) and fully functioning. 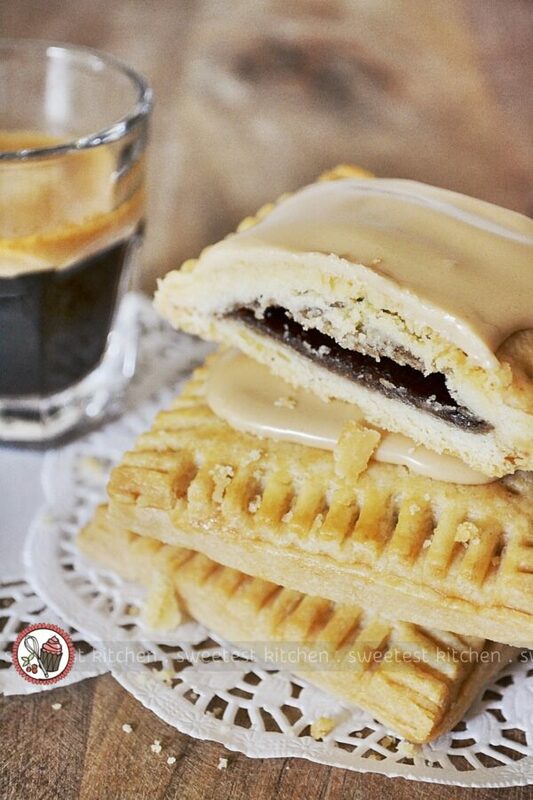 Oh, and these homemade pop-tarts! I hope you like these, too! 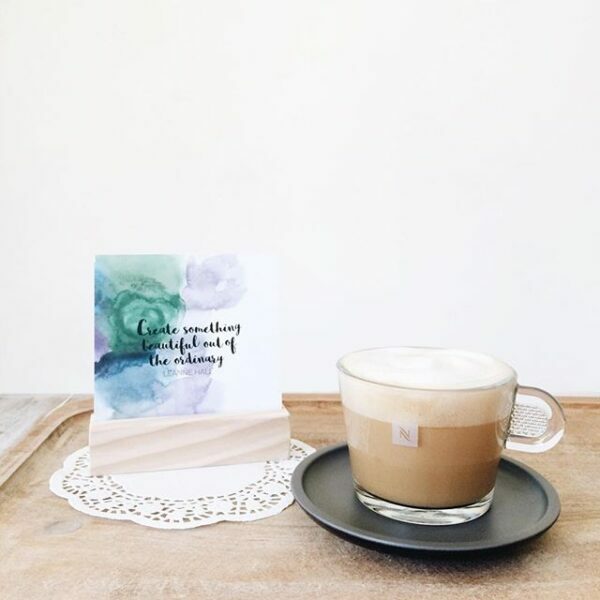 I received an inspirational care package from Nespresso last week; lots of coffee!!! and lots of inspirational quote cards with a little wooden stand to display the quotes. Very cute! Create something beautiful out of the ordinary. I relate to this one in a baking kind of way. Creating something beautiful, like a cake, out of the ordinary, like flour. It describes how I feel about baking to a perfect T! Changing your perspective changes your experiences. This is one that I’d like to say to someone I know. Someone who worries so much about everything that I’m afraid this person is missing out on so many things. I’d like to see this person stop worrying and to actually be happy for once and know what it’s like to enjoy something. Quotes aside, I decided to throw a little something together with some of that coffee from the care package. The coffee I was sent this time included Grand Crus from the Intense range – Ristretto, Arpeggio, and Roma, as well as Kazaar, Dharkan, Arpeggio Decaffeinato, Indriya from India and Roma. As you can imagine, I’ve spent most of my days (and nights) just bouncing off walls like a rubber ball with all this caffeine! Haha! 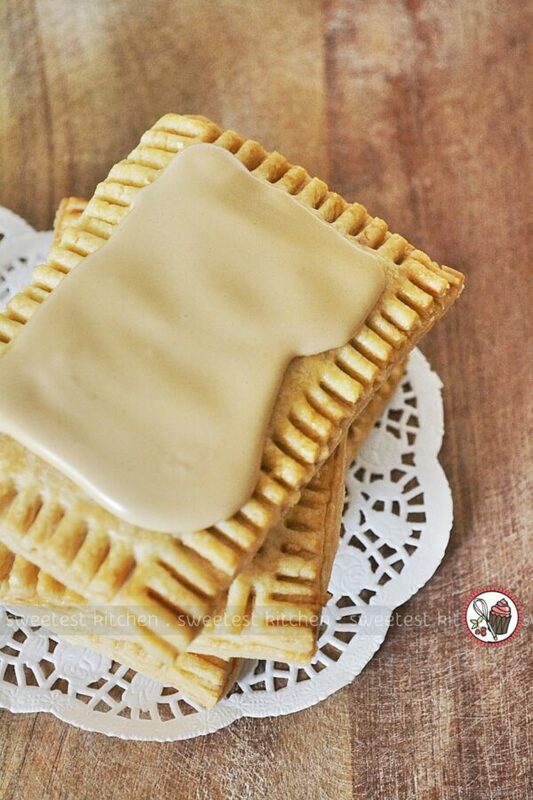 I decided to make a variation of my favorite Pop-Tarts – brown sugar-cinnamon. 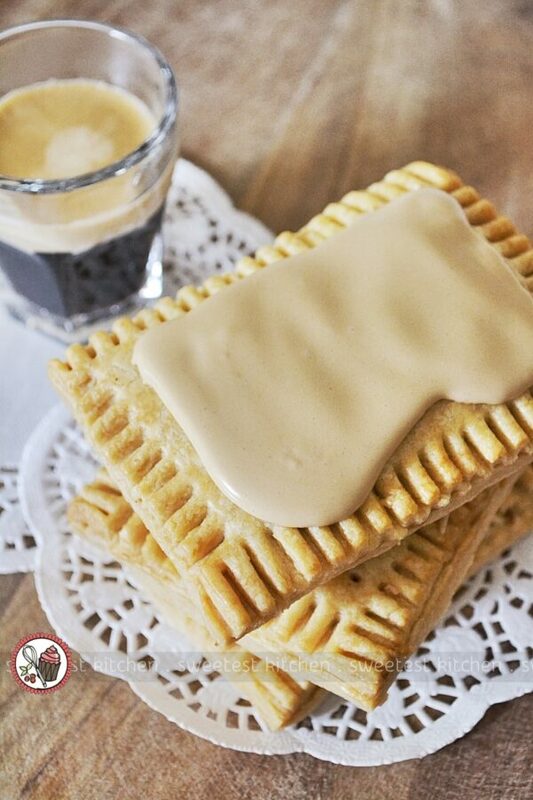 Not that I’m a huge Pop-Tarts fan; in fact, the only Pop-Tarts flavor I like is the unfrosted brown sugar-cinnamon! But I had an idea that one of these Intense coffees may taste quite nice with a bit of pastry and cinnamon. So many coffees to choose from… I ended up choosing Indriya from India because of the slightly spicy note of this particular one. I thought it might go well with the cinnamon spice. 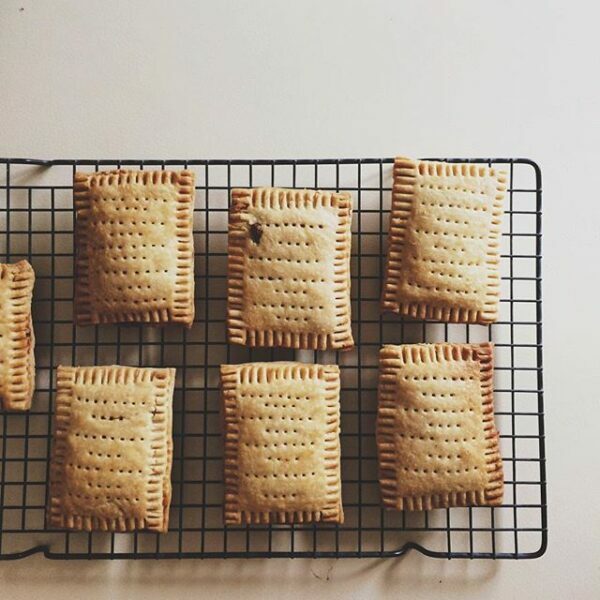 If you’ve never made homemade Pop-Tarts before, it’s not as intimidating as you may think it is. It’s quite fun and relatively easy. Most of this recipe comes from The Candid Appetite. Check out the original recipe for step-by-step photos, which may help if you’re a bit iffy with homemade pastry. The only difficult time I always have is getting the rectangles the same sizes. You would think that using a ruler to measure out the lines would work, but it never does for me! What is wrong with me and rulers!! Anyway. Nevermind about my inability to accurately measure anything. This recipe is quite easy to prepare (especially if you can use a ruler), and the pastry is just whizzed up in a food processor. The filling, just brown sugar and cinnamon (and a bit of flour). The glaze, a simple mix of powdered sugar and pure espresso. 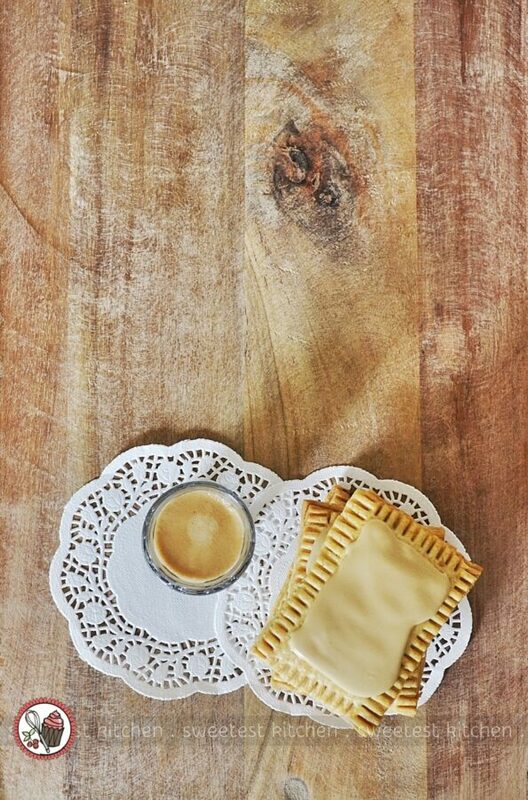 After the pastries spend some quality time in the oven, you’ll have some lovely golden homemade Pop-Tarts. I could hardly resist them straight from the oven. Frosting? What frosting? I would have been happy to devour them all plain. 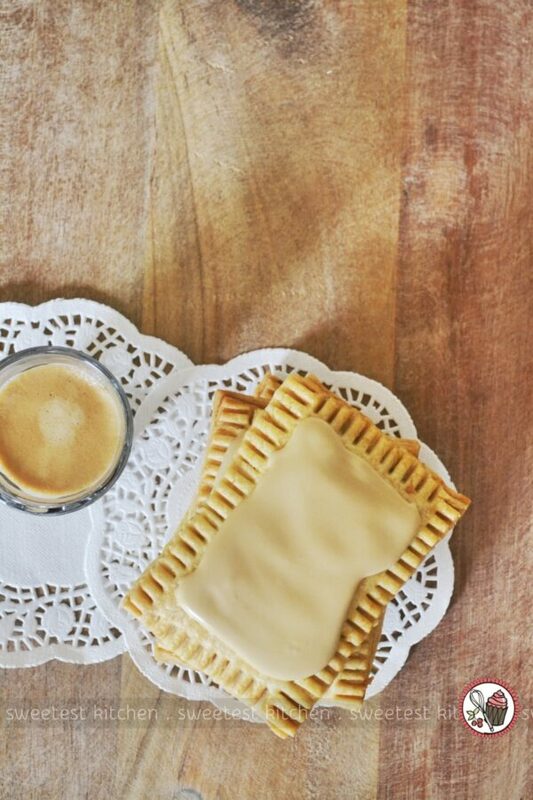 But I summoned all my strength and glazed these golden rectangles with the espresso glaze. How gorgeous are they! Quick note before I end this post… I rolled my pastry just a little bit on the thick side. Accidentally, of course, because, you know, rulers. The pastry also puffs up a bit (of course). A friend of mine who taste-tested these for me also commented that the pastry was a bit thick. I followed the original recipe, which says to roll to 1/8-inch. I’ll be making a pumpkin version of these soon, and I intend on rolling the pastry just a bit thinner than the 1/8-inch. Do you like Pop-Tarts? What’s your favorite flavor? 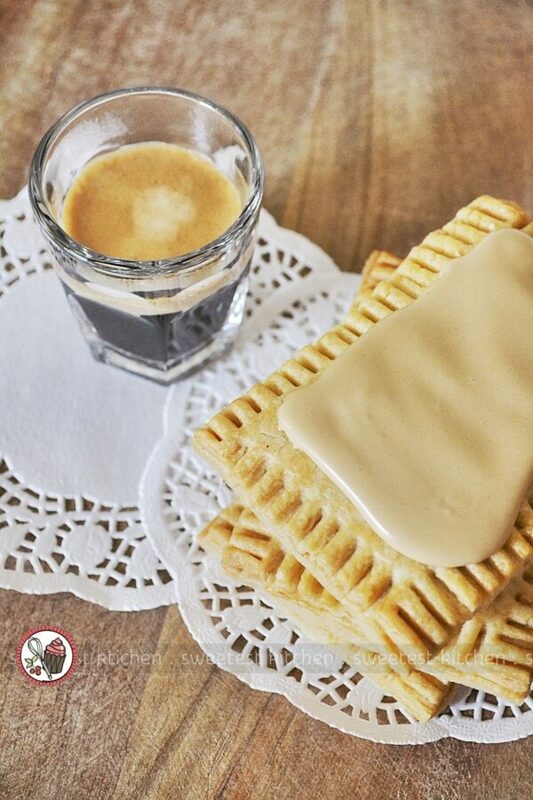 Homemade Pop-Tarts with brown sugar-cinnamon filling and espresso glaze. For the pastry: In the bowl of a food processor, combine the flour and salt; pulse a couple times to combine the ingredients. Add the cold, diced butter, and pulse 10 more times or until the mixture resembles coarse crumbs, about the size of peas. With the machine running, drizzle the ice water through the opening on top of the lid, in a slow, steady stream, one tablespoon at a time, just until dough holds together without being wet or sticky. It should form a ball and come away from the sides. Do not over-process*. Divide the dough in half, and place each half on a piece of plastic wrap. Shape into disks and tightly wrap up in the plastic. Place the disks in the refrigerator and chill for at least 1 hour or up to overnight. For the filling: Whisk ingredients together in a bowl until completely combined. 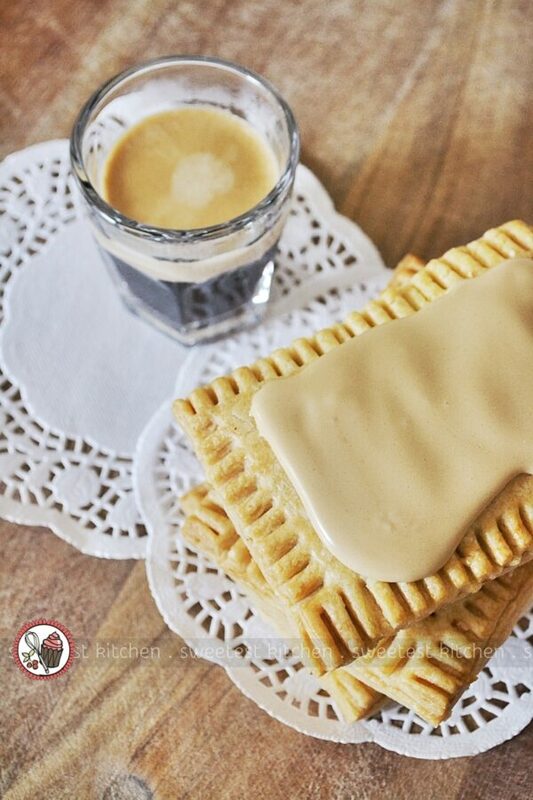 To assemble the pop-tarts: Remove the chilled dough from the refrigerator and allow it to thaw for 10-15 minutes. This will make it easier to work with. Place one disk on a lightly floured work surface, and roll it into a rectangle about 3mm (1/8-inch) thick. Trim the sides of the dough so that it measures 23x30mm (9×12 inches) in size. Cut each piece of dough into thirds and then each third into thirds again. You should end up with 9 rectangular pieces, each measuring 8x10mm (3×4 inches). Using a ruler will make this process easier. Place rectangles carefully on a baking tray lined with baking paper and return to the refrigerator until needed. Repeat with the second disk; place these in the refrigerator until needed. 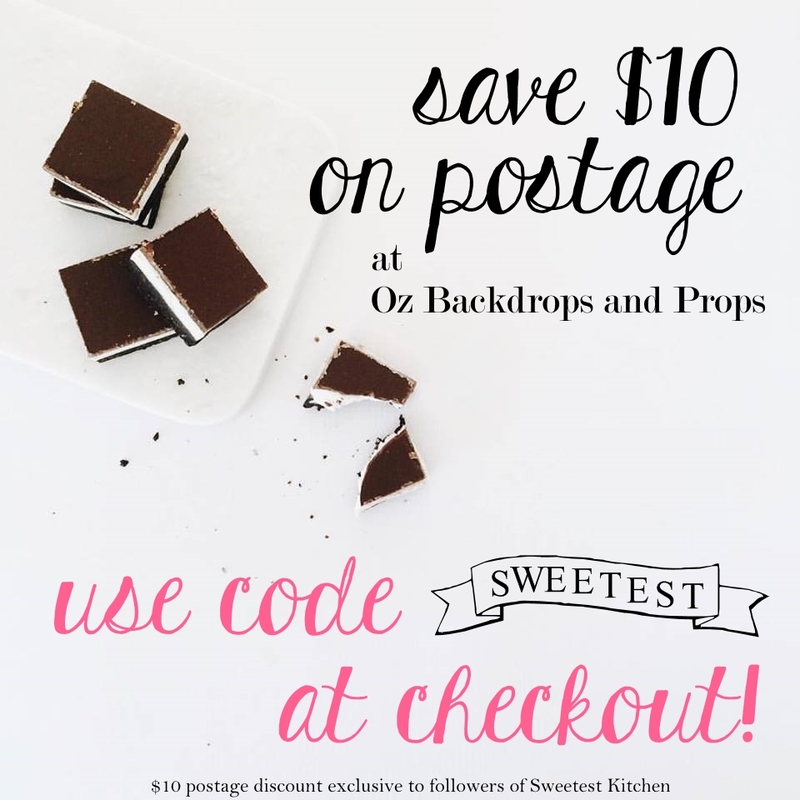 Take your first set of pastry rectangles out of the refrigerator. Beat the egg with a tablespoon of water and brush it over the entire surface of the rectangles. These will be the “bottom” of the tart; the egg will help glue the lid on. Place a heaping tablespoon of filling into the center of each rectangle, making sure to leave about 6mm (1/4-inch) of space around the edges. Take the second set of pastry rectangles out of the refrigerator and place one of these rectangles atop the first set, using your fingertips to press firmly around the filling, sealing the dough well on all sides. Crimp the edges with a fork all around the edge of each rectangle. This will ensure the tarts do not open up during baking. Carefully place the tarts back on the baking tray lined with baking paper. Prick the top of each tart five times with a skewer or tooth pick; this will allow the steam to escape, so that the tarts will become light and airy instead of remaining flat. Brush the tops with extra egg wash. Refrigerate the tarts, uncovered, for about 30 minutes. This will allow the butter in the dough to chill and firm up causing a flakier crust. Meanwhile, preheat the oven to 180C (350F). Remove tarts from the refrigerator and bake for about 20-25 minutes* or until they’re golden brown, rotating the pan halfway through baking. Let the tarts cool on the pan for about 5 minutes, transfer them to a cooling rack and allow to cool completely before glazing. For the glaze: Sift powdered sugar into a bowl. 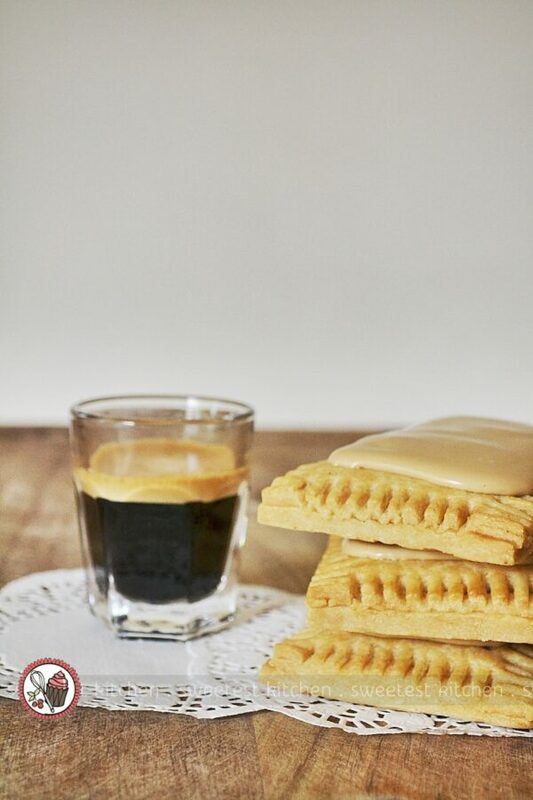 Whisk or stir in 20-25ml espresso, a tablespoon at a time, until no longer lumpy and the glaze is thick, yet still pourable; the idea being that when you pour the glaze on the pop-tart, it doesn't immediately drip down the sides. I made mine thick enough that I had to use a spoon to spread it across the surface. You may not need the full 25ml espresso. Leave the glaze to set for about 30 minutes to harden, then enjoy! * A way to test the dough is by squeezing a small amount of dough together; if it is still dry and doesn’t come together, add a bit more water, 1 tablespoon at a time. * My pastries took closer to 30-35 minutes to bake through and turn golden. While the original recipe yields 9 pastries, I only got 8. Please note that you can't actually place these homemade pasties in the toaster. I definitely love that espresso glaze! Wow! It looks really amazing! I just can’t take my eyes off it!